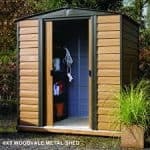 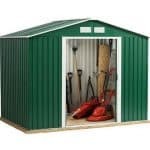 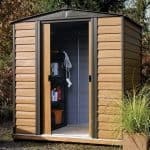 BioHort Europa Metal Shed – Size 1 comes in at a compact 6’ x 3’ – making it ideally suited for those who require a storage shed that won’t take up too much room. 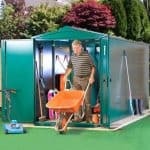 Despite its small dimensions, the clever design of this metal shed means that plenty of equipment can be stored safely. 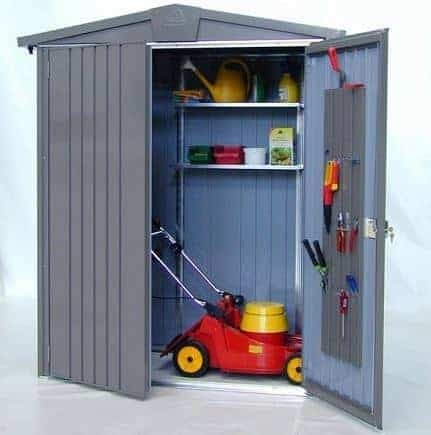 As well as enough floor space to fit a mower and even some foldable garden chairs, the metal storage unit has an integrated organiser system to keep neatly store smaller tools, as well as hooks and shelving for long handled tools and other larger equipment. 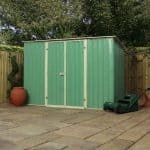 This storage shed is constructed from ribbed, hot-dipped galvanised, polyester coated steel panels, making it a truly robust piece of kit. 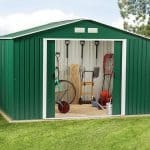 Add to that the high quality cylinder lock, and this metal shed is clearly built with security in mind.